A friend made me this lunch recently and I love how simple and delicious it is. I have added a couple of my own tweaks. 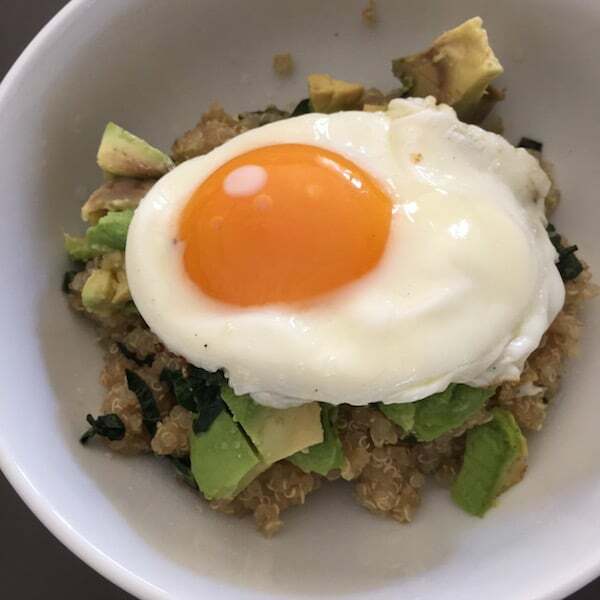 Have the cooked quinoa on hand to make it easy to knock up a healthy lunch, or substitute it with cauliflower rice* for a lower carb option. To prepare the quinoa, rinse 1 cup thoroughly and combine with 1 + ¾ cups of water and a pinch of salt. Bring to the boil, lower the heat and place a lid on the pot. Cook gently for 12-15 minutes until the water is absorbed and the quinoa germs are white. Let it sit for 5 minutes and fluff with a fork. Heat the oil and garlic over medium heat in a frypan until the garlic is fragrant. Add the shredded kale and cook until the kale is wilted, 2 to 3 minutes. You can add a splash of water or stock if you wish. Add ½ cup of the quinoa and cook, stirring until warmed through. Gwyneth suggests ½ cup of cooked quinoa but I often add more. Place the quinoa and kale in a bowl and top with chopped avocado and the lemon juice. Place the egg on top and enjoy! * To make cauliflower rice, pulse a large handful of florettes in a food processor until they resemble fine rice or couscous. You can also use a grater. Fry your cauliflower rice in a pan with a small amount of olive oil or butter for a few minutes, then add the kale and cook until it is wilted.